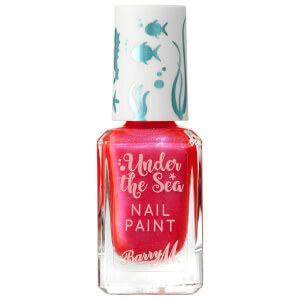 Add instant metallic lustre to your tips with the Molten Metal Nail Paint from British cosmetics label, Barry M. Arriving in several holographic, chrome-effect hues with a mirror-shine foil finish, the nail polish delivers a colour-shifting iridescence. Long-wearing and chip-resistant, the nail varnish glides on effortlessly and evenly for nails that hypnotise. Try one coat for a sheer finish or build up for a stronger look. Butyl Acetate, Ethyl Acetate, Nitrocellulose, Adipic Acid/Neopentyl Glycol/Trimellitic Anhydride Copolymer, Acetyl Tributyl Citrate, Isopropyl Alcohol, Acrylates Copolymer, Stearalkonium Bentonite, N-Butyl Alcohol, Calcium Aluminum Borosilicate, Silica, Benzophenone-1, Trimethylpentanediyl Dibenzoate, Polyvinyl Butyral, Polyurethane-67, Methoxyisopropyl Acetate, Diacetone Alcohol, Decyl Alcohol, Phosphoric Acid, CI 77000, CI 77891, CI 77510, Tin Oxide, CI 77266 [nano], CI 19140.